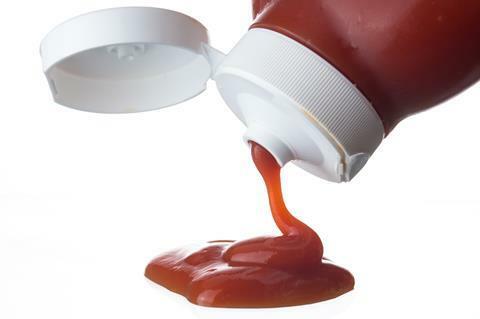 A way to make plastic packaging ultra slippery has been discovered by US researchers, who say their technology could help solve the problem of foods such as ketchup sticking to the inside of plastic containers, which causes food waste and consumer annoyance. The work is based on SLIPS (slippery liquid-infused porous surfaces) technology, which was first developed in 2011. SLIPS was inspired by the carnivorous pitcher plant Nepenthes, which captures insects using a slippery jug-like leaf with microscopic ridges covered in a lubricating layer of nectar. Scientists have explored using SLIPS for various applications, from non-stick packaging to anti-fouling surfaces. But most approaches have been limited to using expensive silicone or fluorine based polymers and require complex engineering to create surface roughness. Now, Jonathan Boreyko’s lab at Virginia Tech has shown that commonly used food-grade plastics, including polyethylene and polypropylene, can be converted into SLIPS by simply coating them with vegetable oil that becomes trapped inside the material’s structure. The team was surprised by this discovery because it was generally thought to be impossible for oils to permeate into hydrocarbon-based polymer films. Indeed, this resistance is why such plastics are often used as backing and protective materials in SLIPS studies, Boreyko says. ‘We didn’t expect our approach to work at all, we were just trying it in an attempt to confirm that it wouldn’t work,’ he tells Chemistry World. The team developed multi-layer polymer films comprising a 10um layer of ultra low density polyethylene (ULDPE) placed on top of impermeable tie layers and a backing layer. When they coated the ULDPE side with cottonseed oil the surface became more slippery to water droplets. Laser scanning microscopy revealed the oil wasn’t just sitting on the surface, but had impregnated the polymer to a depth of 1.3um. Wicking experiments showed that oil could wick vertically up the ULDPE film, indicating that its structure must absorb oil into the surface by capillary action. Further experiments showed that ketchup and yogurt drained more easily from pouches made from the slippery plastic than untreated plastic. They even remained slippery after several weeks of being submerged in ketchup. The technique was also shown to work with soybean and canola oils, as well as other plastics including polypropylene and medium density polyethylene. With the current trends, it would be really good to make this work with biopolymers.